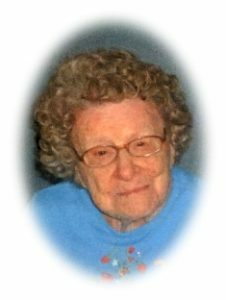 Rosalie M. Braun, “Sally”, age 101, died August 7, 2017 at Heritage Nursing and Rehabilitation Center in Port Washington, Wisconsin where she had resided since 2009. She was born January 22, 1916 in Charlesburg, Wisconsin to Peter and Barbara Leitner Karls. She married Jerome A. Braun of Ashford, Wisconsin on September 17, 1940 in Milwaukee. They lived in Milwaukee for a while before making their home in Fredonia, Wisconsin across from St. Rose of Lima Catholic Church. Jerome operated a barber shop from their home for many years. He preceded her in death February 1, 1993. Sally was active at St. Rose Parish for many years. She enjoyed playing cards and BINGO. She is survived by her niece Mary Ann (David) Schneider of Mount Calvary, Wisconsin , a sister-in-law Leona Karls of Chilton Wisconsin, other nieces nephews and friends. Sally is preceded in death by her husband Jerome, daughter Barbara Ann, her sisters Marie Olszyk, Marcella Kraemer, Martina Zolp, Adeline Schrweide and Margaret Morgan and her brothers Alfred, Edmund and Joseph Karls. The Rev. Todd Budde will celebrate a Mass of Christian Burial 3PM Thursday, August 10, 2017 at Divine Savior Parish, St Rose Chapel, 305 Fredonia Avenue, Fredona, Wisconsin. Visitation from 1:30 to 3pm Thursday AT CHURCH. Interment parish cemetery.